The Catechism of the Catholic Church teaches that liturgy is a “privileged place” for catechesis. There’s an old maxim regarding Catholic worship: Lex orandi, lex credendi, or we pray what we believe and believe what we pray. 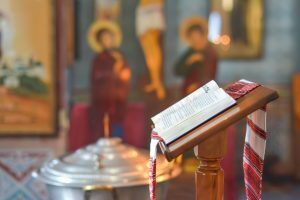 In other words, the prayers and devotions of the liturgy are an expression of the Church’s core teaching. 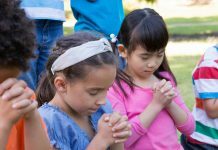 What follows is this: In the praying, we are also taught. There’s a richness of Catholic thought and practice contained in the rites, devotions, and traditions of the liturgy. Utilizing them in your teaching can deepen your students’ understanding, increase their engagement, and add new dimensions to your catechetical presentation. In this article, I’ll show you how catechesis and liturgy can fit together and how to incorporate liturgy into your classroom. Liturgy synchronizes well with faith formation because it makes faith sensory. 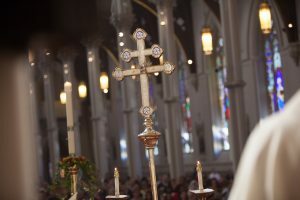 The “smells and bells” of Catholic worship — statues, stained glass, icons, changing vestment and altar colors, church decorations, and swinging incense holders — are tangible. They’re like giant object lessons that incarnate faith and hit different learning modalities. Children experience the world through their bodies as well as through their minds and imaginations. Liturgy is worship that takes our humanness into account and expresses faith in memorable ways. It can also help dry doctrinal topics come alive. Of course, there’s also grace. Adding liturgical elements to your catechetical sessions introduces an atmosphere of prayer. You’re inviting the Holy Spirit into your classroom and into your students’ minds to help them understand supernatural truths that really can only be comprehended with God’s help. To make catechesis liturgical, add things to your lessons that make your classroom look more like church. of the Gospels. 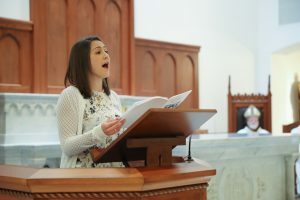 Say all the same things you say at Mass, such as, “A reading from the Book of Exodus” or “The Gospel of the Lord.” Have your students respond in kind with, “Praise to you, Lord Jesus Christ” just as they would at Mass. If students are older, you can have them read the first reading and psalm, while you, as the teacher, read the Gospel. Make the Sign of the Cross on your forehead, lips, and heart before reading … the whole nine yards. You may even want to read the Opening Prayer. Or, if you’re really brave, begin by processing around the room with one student holding the Bible as the lector does at the entrance to Mass. A Celebration of the Word provides a “calculated disengagement.” It marks the fact that you’re leaving behind the outside world and beginning something sacred and solemn. It says that this is something altogether different. You’re about to learn about God, and it requires reverence and respect. This activity also highlights the prominence of Scripture in the life and teaching of the Church. It’s best to use a set of readings that relate to the topic you’re about to teach. 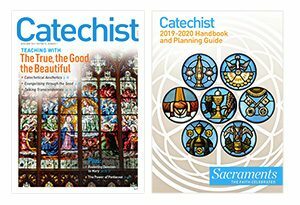 The RCIA Catechist’s Manual, available from Liturgical Training Publications, is a fabulous resource to help with this. It provides sets of Scripture passages and psalms matched to doctrines. Don’t forget the physical environment of your classroom, as well. Schoolrooms and partitioned parish hall meeting rooms are not ideal spaces for catechesis, but it’s what most of us must deal with. Find ways to decorate your space with additional liturgical elements. Create a prayer table with a Bible placed prominently on a stand. During the upcoming Advent season, drape it with a purple cloth to match what the students see in church. Include a crucifix, a candle (if you can), or perhaps an icon of the Nativity or the Blessed Virgin. Could you put up a banner that emphasizes the liturgical season? 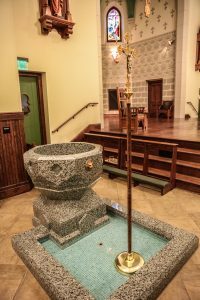 Is there a way to place a small holy water font at the entrance so students can bless themselves as they enter and exit the space? Anything you can add that reminds them of being in church will help create this liturgical atmosphere and increase engagement. Many of the prayers used for celebrating sacraments are catechetical lessons in themselves. For example, the Blessing and Invocation of God over Baptismal Water from the Rite of Baptism recounts all the times in salvation history God used water for saving purposes, such as the flood and the parting of the Red Sea. You can explain the theology of Baptism using these Old and New Testament symbolisms. Try this activity: The next time you teach about Baptism, have a priest come to your class. Place a white cloth and a bowl of tap water on your prayer table. Start with a Celebration of the Word using Scripture passages from the baptismal rite. Have the priest read the Gospel and then bless the water using the prayer from the rite. When you teach the lesson, refer back to the prayer at the appropriate points. At the end of the lesson, fill holy water bottles with the newly blessed water and give them to your students. 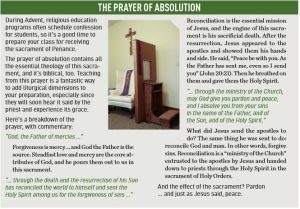 You can do the same with all the “epiclesis” prayers for the sacraments, such as the prayer of absolution used in the sacrament of Penance and Reconciliation (see sidebar). “Liturgical catechesis aims to initiate people into the mystery of Christ (It is “mystagogy.”) by proceeding from the visible to the invisible, from the sign to the thing signified” (CCC, 1075). Structuring worship and devotion by season is another way the Church takes our humanness into account. We all live by seasons. Think of how excitement and anticipation builds as you approach Christmas, or how your activities have changed with the weather. It’s the same with the liturgical year. 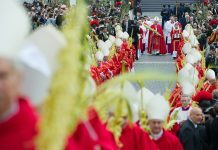 Different liturgical seasons keep things fresh and interesting. The Christmas season is the perfect example. There are all kinds of parties, celebrations, and gift-giving. However, that’s not the Christian meaning of Christmas, and you can draw that out using elements from the Advent liturgies. 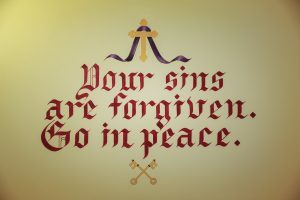 Advent has a somber, penitential tone. It asks us to anticipate in the celebratory season of Christmas with preparation instead of parties. The reading sets at Advent Masses are intimately connected, so you can use them in your Celebrations of the Word. They recall the longing the Israelites endured as they waited for the Messiah. Tie that to the anticipation we feel as we wait to celebrate the birth of the Savior. Also, the readings show the counter-position of Old Testament messianic prophecy and Gospel fulfillment. You can use this to teach about the Incarnation and Jesus’ mission to save mankind. The liturgies get to the heart of what Christmas really means. Magnificat magazine is an excellent source for reading sets and other prayers associated with daily and weekly Masses. There are other traditional Advent activities that teach about Jesus and the true meaning of Christmas. Advent wreaths and Advent calendars count the days and highlight the Gospel events leading up to Christ’s birth. The Jesse Tree is a great object lesson for learning how different Old Testament characters from Jesus’ genealogy foreshadow his life and illuminate his mission. There are also entertaining and extremely informative books that tell the story of Jesus’ birth as a historical fiction narrative. Another important aspect of the liturgical year is the calendar of saints’ feast days. There are numerous books at all age levels that give short biographies of the saints. Consider taking some time every class to read about a saint whose feast day is that week. Advent is a great time to teach about Mary because she features so prominently in the infancy narratives being read at Mass. There are two wonderful feast days in December that teach Mary’s role in salvation: The Immaculate Conception on December 8 and St. Juan Diego on December 11 (along with Our Lady of Guadalupe on December 12). Liturgy provides a treasury of sights, sounds, seasons, activities, and prayers to enrich your catechetical presentations and enhance your students’ learning. Because the Church prays what she believes, liturgy is essentially catechetical. Liturgical elements add learning modalities and concrete activities that are catechetical, while at the same time providing liturgical education. Infusing your lessons with the atmosphere of liturgy prepares students to participate more fully in actual liturgies. The possibilities are limited only by your imagination. The next time you’re at Mass or participate in a sacramental celebration, notice what’s going on. Is there an action that makes it special? Are the readings memorable? Do the prayers teach something? Consider how you can use these elements in your class. Marc Cardaronella, MA, is the director at the Bishop Helmsing Institute for Faith Formation, Diocese of Kansas City — St. Joseph, Missouri. 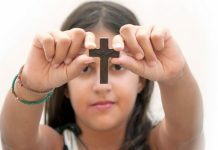 He is the author of Keep Your Kids Catholic: Sharing Your Faith and Making It Stick, and he blogs at MarcCardaronella.com. Previous articleHurry—Only Four More Weeks ’til Christmas!